The first significant regional wine tasting festival will be held at the Honda Grand Terrace Event Center in Anaheim, CA, on Saturday, November 8, 2014, from 10:00 am to 2:00 pm. Sponsored by Orange Coast Magazine and West Sonoma Coast Vintners, this will be a look at the newest trend in wine tasting festivals. West Sonoma County Vintners hold their annual West of West Festival in Sebastopol in early August, but recently have begun taking the event on the road. This year’s Pinot-charged festival will also have participating restaurants such as Charlie Palmer at Bloomingdale’s, The Winery, and Wineworks for Everyone, offering gourmet bites to compliment West Sonoma County Pinot Noir. In addition, there will be a Sommelier Challenge, a Meet & Greet with Orange Coast Magazine’s bloggers, The Wine Dudes, Rusty Gaffney and Eric Anderson. The festivities also include entertainment, and lounges sponsored by Sub-Zero and Celebrity Cruises. The list of participating wineries includes some of California’s most esteemed producers including DuMOL, Failla, Flowers, Freeman, Joseph Phelps Freestone, Littorai, Martinelli, Peay, Red Car, Siduri and Soliste. Many of these wineries rarely pour their very limited production wines for the public. And, what an opportunity to taste the wines from very small, boutique producers who are well-known among the Pinot Geek community such as 32 Winds, Alma Fria, Ceritas, Claypool Cellars, Ernest, Gros Ventre, Pitchoune, LaRue, Senses, Small Vines, Wayfarer and Zepaltas. I have reviewed the wines from almost all these special vintners, and can tell you that this is a very unique tasting opportunity, especially for the Orange County community of wine enthusiasts. For tickets, visit www.orangecoast.com/wowoc. PinotFile readers use code WOWFRFAM for a $99 discount on tickets. 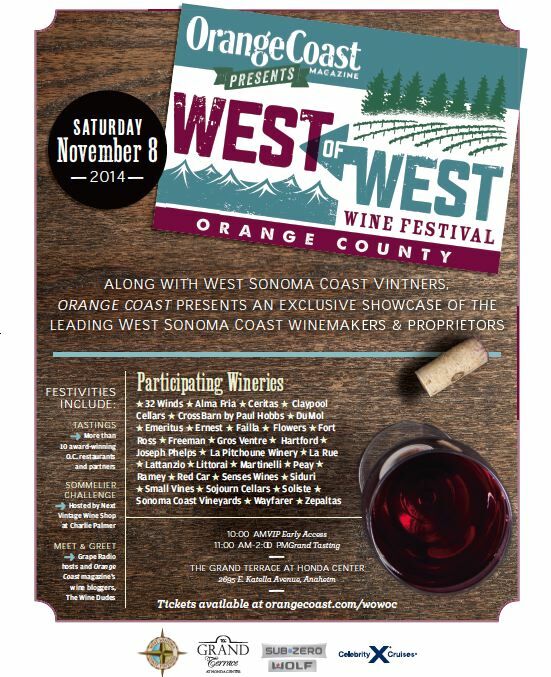 I look forward to sharing great Pinot Noir with PinotFile readers at West of West Orange County.